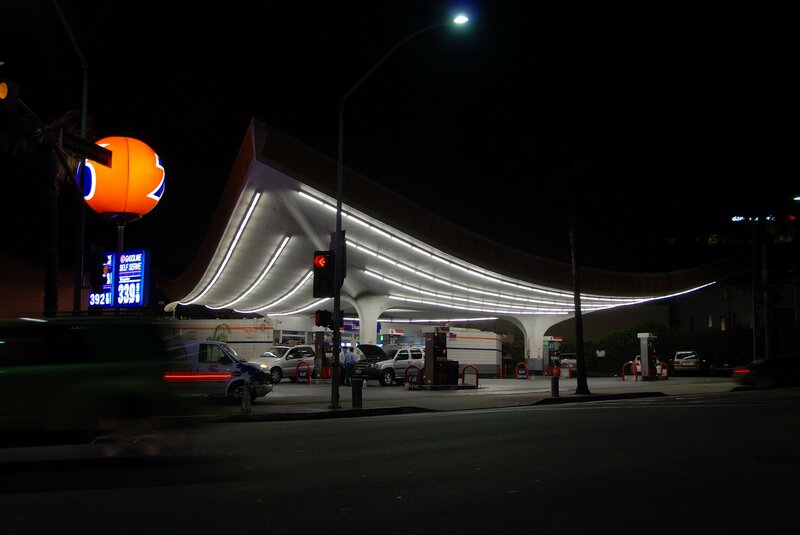 Jack Colker’s 76 Station is a bona fide classic of mid-century modern architecture. Completed in 1965, the structure was originally intended to be featured along with the Theme Tower in Los Angeles International Airport, offering a means for car-hire travellers to fill up at right in the airport. When this idea was scrapped, ownership of the design was passed onto Union Oil Company, with the finished article ending up at the corner of Crescent Drive and Little Santa Monica Boulevard in Beverley Hills. The man responsible this striking mid-century design was Chinese-American architect Gin D. Wong, and despite its self-evident grandiosity, this was among the smaller-scale projects which Wong worked on in his long career. Indeed, Wong was responsible for several big projects, including the Atlantic Richfield Company (ARCO) Headquarters Building in Downtown Los Angeles; the Columbia Broadcasting System Television City, and the LAX Theme Building in Los Angeles Airport, the latter another icon of the space age. 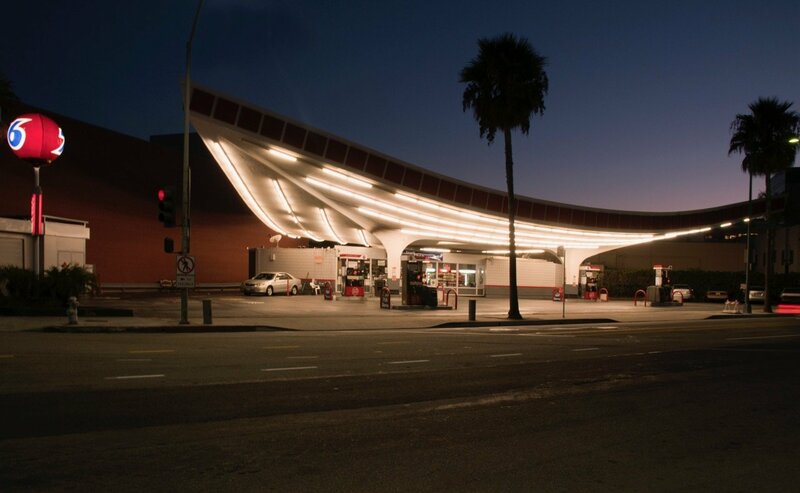 Even so, the architect’s recent obituary in the New York Times—he died in September this year—describes the gas station as “one of his most beloved and enduring” works. There are obvious reasons for this. What’s especially pleasing about the place is that it still clearly continues to be used for its original purpose. This is no museum piece. Rather, you can see the marks of the countless cars that have come to fill up their tanks there. It is rough and worn, and despite (or perhaps because) of this, it remains distinctly modern. Yet, all the while, that bright red canopy leaps out towards the road, beckoning drivers towards it. In this it is like a lot of Googie design from the era: precisely calculated to be viewed while travelling at speed. True to LA’s penchant for reinventing itself, many of these kinds of structures were torn-down as quickly as they were thrown up. 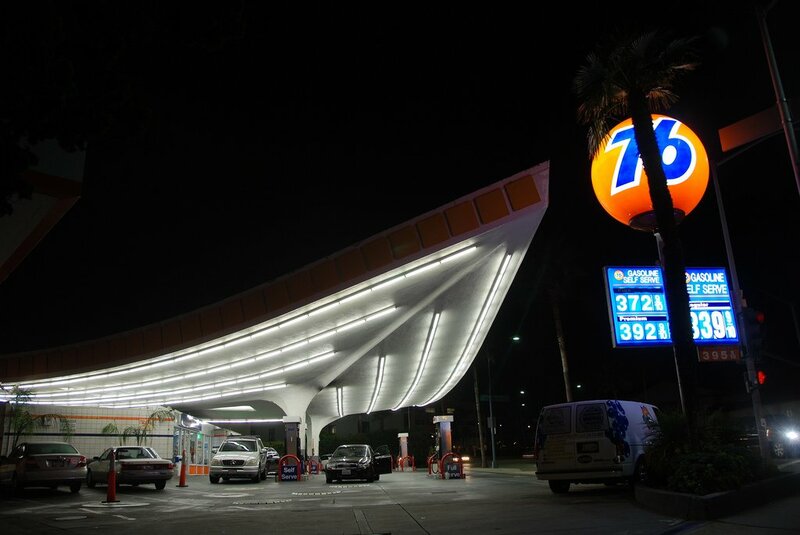 Luckily, this gas station stands tall as a wonderful reminder of how wide the space age impacted on everyday mid-century architecture.